Parkinson’s disease (PD) is a neurodegenerative disease affecting more than a million people in the USA alone. While there are effective symptomatic treatments for PD, there is an urgent need for new therapies that slow or halt the progressive death of dopaminergic neurons. Significant progress has been made in understanding the pathophysiology of PD, which has substantially facilitated the discovery efforts to identify novel drugs. 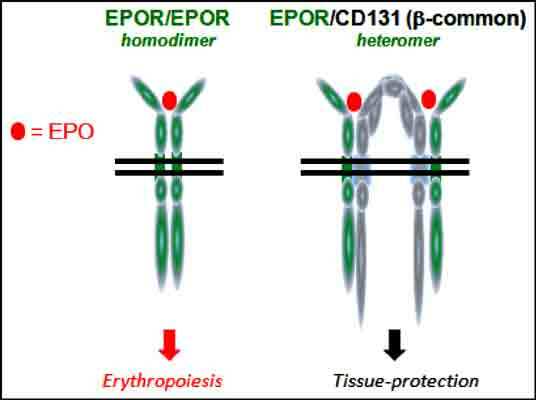 The tissue-protective erythropoietin (EPO) receptor, EPOR/CD131, has emerged as one promising target for disease-modifying therapies. Recombinant human EPO (rhEPO), several variants of EPO, EPO-mimetic peptides, cell-based therapies using cells incubated with or expressing EPO, gene therapy vectors encoding EPO, and small molecule EPO mimetic compounds all show potential as therapeutic candidates. Agonists of the EPOR/CD131 receptor demonstrate potent anti-apoptotic, antioxidant, and anti-inflammatory effects and protect neurons, including dopaminergic neurons, from diverse insults in vitro and in vivo. When delivered directly to the striatum, rhEPO protects dopaminergic neurons in animal models of PD. Early-stage clinical trials testing systemic rhEPO have provided encouraging results, while additional controlled studies are required to fully assess the potential of the treatment. Poor CNS availability of proteins and challenges related to invasive delivery limit delivery of EPO protein. Several variants of EPO and small molecule agonists of the EPO receptors are making progress in preclinical studies and may offer solutions to these challenges. While EPO was initially discovered as the primary modulator of erythropoiesis, the discovery and characterization of the tissue-protective EPOR/CD131 receptor offer an opportunity to selectively target the neuroprotective receptor as an approach to identify disease-modifying treatments for PD. Dopamine, Erythropoietin, Neuroprotection, Parkinson’s disease, Receptor agonist, Disease-modifying treatment, Small molecule. STATegics, Inc., 1455 Adams Drive, Menlo Park, CA, USA.